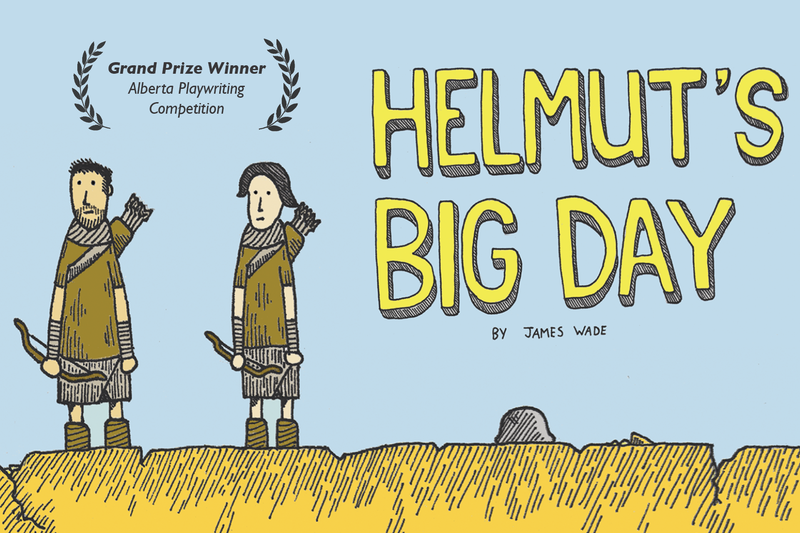 James Wade’s Helmut’s Big Day is one of 27 shows running at the 2015 Calgary Fringe Festival. The Empire is good, God is great, and the uncivilized, Cat-Demon worshipping Barbarians call the Barren Plain home. Sabir (Alan Johnson) knows these three things for sure, except…well, the Barren Plain is the one with the small bush, right? Presented by Red Phone Theatre, James Wade’s Helmut’s Big Day is a satirical comedy that pokes fun at notions of empire and conformity. The play blends hijinks and philosophy for a breezy, though sometimes sluggish, critique of political ideologies. Atop the wall separating the Empire from the Barren Plain, Sabir keeps a vigilant eye over the Great Plain which he is sworn to protect. While marching back and forth may not be glamorous, Sabir is compelled to serve the Empire because, according to the army’s manuals, God is watching – always watching. Lonely at his post, Sabir finds a friend in Helmut, a soldier’s helmet he converses with. Sabir’s troubles begins when Helmut “asks” him to identify what the difference is between the two Plains. (After all, they’re both plain!) The question, at first taken with confidence, makes Sabir uneasy as what he actually sees, which is no discernible difference at all, stands at odds with the narratives fed to him by the Empire. As the contradiction disturbs Sabir, he suddenly spots riders approaching from both sides. Which is the enemy, which is the ally, the problem of the Plains worsens with every passing second. The nature of Sabir’s blind loyalty to the Empire reveals itself further when Katar (Emma Sinclair) comes to check on her comrade. Also confused by the Plains, Katar proposes the idea that morality is subjective, that maybe the Barbarians see themselves as good and the Empire as evil. Either that, Katar says, or life is random and all action, like guarding the wall, is meaningless. (God, Cat-Demon, makes no difference in the end). Sabir dismisses Katar’s foolish ideas, despite being confronted by the falseness of the Empire head on. What emerges from the total confusion of these two lowly soldiers is sheer buffoonery. Sabir and Katar’s ‘best’ judgement leads to disastrous results. While fun, Wade’s expression of these philosophical ideas is largely cumbersome. The script has difficulty weaving the play’s big ideas and physical humour together without resorting to mouthfuls. The ideas land heavy and, as a result, interrupt Johnson and Sinclair’s comedic antics. Director/Designer Kathryn Smith’s clean, simple set helps the action flow neatly. Smith’s remedies the sometimes stagnant pace of the script by employing the two wall borders to create and thrust the audience into the panicked frenzy shared between Sabir and Katar. The use of the wall borders to show different dimensions of both the wall and the action is smart. The snappy chemistry between Johnson and Sinclair is enjoyable, though not so much until later in the show when the script gives the actors more room to play. Sinclair’s performance as the oblivious ‘wise fool’ plays well against Johnson’s condescending, but utterly foolish character. Ultimately, Helmut’s Big Day satirical bite is bogged down by clumsy dialogue. The play delivers fun, physical humour, but its commentary struggles to have a sharp presence in the mix. Presented by Red Phone Theatre, James Wade’s Helmut’s Big Day runs July 31st – August 8th at the 2015 Calgary Fringe Festival.